We all put great effort into preparing ourselves for our favorite sports and standup paddlers are no exception. WE research the best paddles and boards until we make our decision to purchase. Our first attempts at paddling lack the refinement that generates the best results and the most fun, so we seek training. Fortunately for us, Suzie Cooney, CPT of Suzie Trains Maui suggested that we use the TRX RIP Training and suspension method – and after 4 weeks we can see the difference that practice has made. I have had 5 knee surgeries and am no stranger to PT and the guidance of a physical therapist. With that, I still managed to use the RIP Trainer inappropriately for my current condition. I have no excuse. The included dvd is incredibly thorough, mindful and full of guidance and alternate moves for every fitness level. Silly me! I tried to do the squat moves on a large balance cushion while being torqued asymmetrically – bad idea. Pete agreed, that was not the way to adjust a personal training routine. 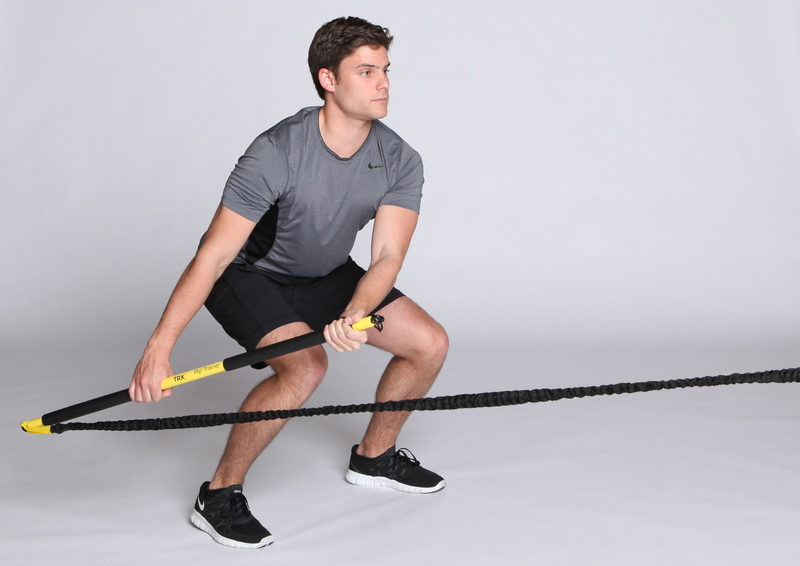 It is important for the individual to “own” the movement required in each of the carefully designed exercises in the TRX program before altering them. After my little foray into truly poor form, I let my knees recover and then began the program again. This time I performed each of the squat motions in a controlled manner as explained in the excellent training dvd (included). Now,I may be protecting myself from future injury, particularly during skiing. I do make sure my knee tracks over my toes. I also stop the bend at the point of pain. Paying attention to detail allows optimal training sessions and results. First question: Do you have modifications or suggestions for doing the RIP Trainer moves that minimize the squat, yet still engage the core and provide adequate intensity? Modifying depth of squat is the best way to alleviate flexion/extension loads through the knee joints. Much of the strengthening of squat based exercises (such as the Rip Pitchfork, Rip Squat Row, Rip Squat Press, etc.,) come from co-contraction of the knee flexors and extensors (hamstrings/quads.) Thus, range of motion isn’t critical; what is critical is knee alignment and precise, fluid movement patterns. For ACL injury prevention or recovery, the hamstring muscles are of HUGE importance so any exercises which face the anchor are excellent because they activate the posterior chain (hamstrings, gluteus, spinal erectors, etc.) more preferentially. ANY Rip Training exercise, if performed properly, engages the core. Focus on maintaining perfect posture, balance and stability. Even just holding isometric positions while facing away from, facing or sidefacing the anchor will be excellent for core strength and stability. I explained to Pete that I have started doing a few of the RIP Trainer exercises on the Gigante cushion with an Indo Rocker board. Sometimes the front foot is on the cushion/board while the back foot is on the floor. Sometimes I have both feet on the Indo board (it would be rocking left/right not forward back) in the wide stance. I notice that when I do the exercises this way I feel more core, have to concentrate more on neutral spine and do the movement more slowly. I do the exercise on the Indo board in addition to doing them on the floor. Since my training is meant for SUP it makes sense for the added balance challenge. I asked if Pete had comments or insights on this? Pete replied, “Training on labile surfaces (BOSU, Rocker boards, Indo’s, etc.,) is great for proprioception and improving balance. Keep in mind, the asymmetrical loading of the Rip Trainer provides a balance challenge in itself, so I would really “own” the movements prior to adding increased balanced challenges.” From my experience, I absolutely agree with that advice. When a standup paddler really takes the time, focus and effort to refine the stroke technique, when doing TRX training, refining focus and technique also delivers the best results and experience. Pete suggests, “The Rip Paddle Board Row is a great exercise which can be performed at slower speeds with less resistance to simulate SUP (see attached images). You can alternate from right to left sides (changing power and base hands,) every minute and you can also change your stance from parallel to staggered to work different muscles over the 15 minute time period. This is a simple endurance workout which can challenge users at any level and really “maps” well to the movements of SUP. Training on the TRX requires your core to be active and engaged during the entire training session. The functional and dynamic movements performed using the TRX all require the core to stabilize and balance the body. 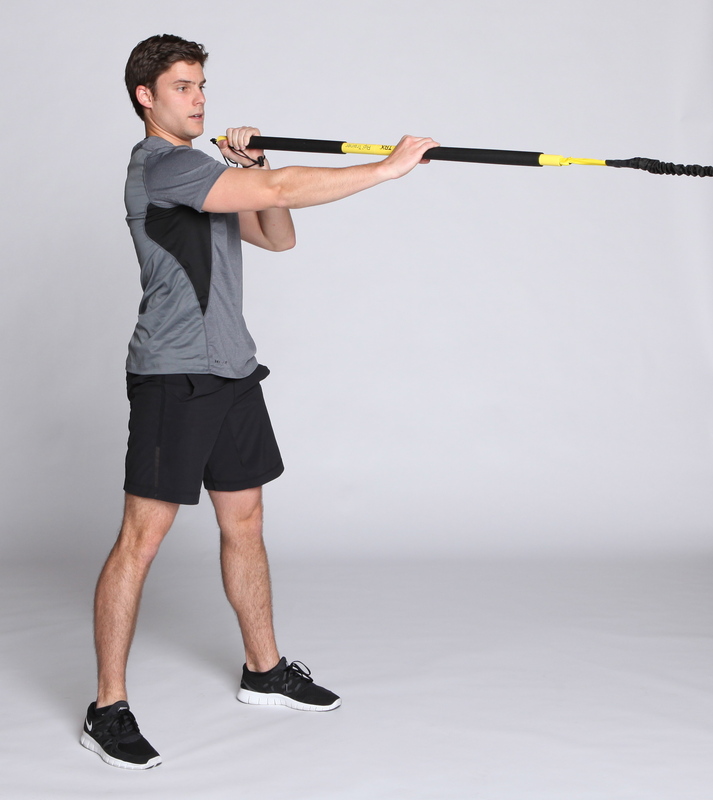 For example, while performing a bicep curl with the TRX, you must engage your core to stabilize your body. You work the specific muscle, but are also working ALL of your core muscles at the same time. There is no need to spend extra time doing hundreds of crunches, or back extensions. Grab some straps and train like a Navy Seal to change your body and keep it ready for SUP all year long!